and how it was a HIT with you guys, but then you were all..."What the HECK? You show us a cool project and then don't have custom options in your shop, so we can't have our OWN address subway art!?" Now, fast forward 1 year and about a bajillion emails later, from all of you asking where you can find someone to print/make something similar... and I've FINALLY found it! Geezees Custom Canvas Creations! I have seen a lot of companies attempt personalized subway art, and I have to say, that Miss Stephanie's designs are definitely the cream of the crop. 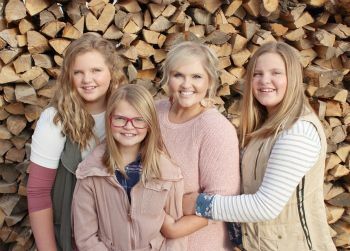 Stephanie started Geezees in 2009 as a way to create custom artwork for her home and quickly after that, quit her other job and Geezees was FULL-TIME. 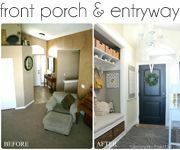 Four years and 4,000 sales later, her custom pieces have been recognized and celebrated amongst the top bloggers of home decor, wedding fashion, and gift ideas; making Geezees unique art a highly coveted and talked about treasure in any home or office. Recently Stephanie has introduced her newest designs called, the Typography ELITE Series. This is what you've all been looking for! Stephanie has designed a layered text look and combined beautiful fonts with the MOST important dates, locations and memories in your life to create GREAT home décor conversation pieces, and also perfect birthday, wedding or anniversary gifts. After chatting with Stephanie further about how I KNEW my readers would love the custom prints from her shop, she kindly offered to do a giveaway as well! Alright, enough talking, I'm going to show you my favorite NON address art that Geezees carries, so you can get an idea of what else is possible! There's just something so magical about being able to see and read the thoughts, love and pure feelings that someone has about somebody else. It's powerful, meaningful and completely personal... don't you agree? That being said, what canvas creation in the Geezees Shop would YOU pick to display in your home if you won? Head on over, (get lost in beautiful designs, vows and quotes) brows around the Geezees Shop and then come back here and leave a comment letting me know what design speaks to you the most! Pin your favorite Geezees canvas art print. Simply pin one or a few of your favorite Geezees designs to one of your Pinterest boards, and share these fun customizable canvas ideas with others! Then leave me a comment back here, letting me know you did so. Giveaway includes a 12x16 custom canvas print by Geezees Custom Canvas Art. Shipping is also included. Giveaway is ONLY OPEN to U.S. residents. If you choose not to have your email address attached to your commenting account, please leave a way for me to contact you in your comment, via email, if you are the winner. Winner will be announced on our Facebook page a week from today. 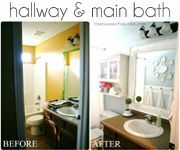 You can catch all of Stephanie's fabulous design updates and other ideas on the Geezees Blog, Facebook page, Twitter and Pinterest. I love this giveaway and I'm super excited to FINALLY have a great place to refer my readers to, when they want this fun typography/subway art type look! 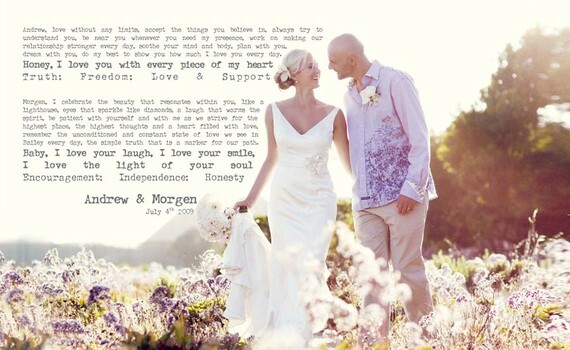 I love the designs with a wedding photo and wedding vows/love notes surronding it! I am a recent newly wed and we love leaving each other love notes to have them displayed on a canvas would be a constant reminder of why we fell in love with each other. I also pinned my favorite canvas to my gift of giving board on Pinterest! I love the nursery art set. I am having a terrible time choosing just one thing to "like"! Everything is beautiful! That being said, I'm a sucker for all of the photo art...pictures of my girls are always a fave! I also really love the custom canvases with "our song" on them...especially the one hung above the bed! Talk about getting lost in a website. These canvases are wonderful. I love how each one is customized and so personnel. I pinned one of my favorites to my Quotes and Accessories that I love! board. Thanks for finding this giveaway... as a expectant mother of my 1st long awaited child I am excited to have the possibility of winning this! I loved all of them but I really loved the ultrasound with quote! Such a real reminder of the sacrifice of motherhood! Oh and for a second entry.... I pinned several different options on Pinterest. What a great gift this would be for a newlywed couple or new parents or even grandparents. I dearly love the Family Creed House Rules. Thank you so much for the chance! I like the romantic canvas where you have the wedding couple and their vows or first song lyrics printed next to them. 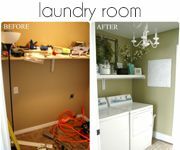 I'd love to do something like that in my master bedroom. I've pinned the canvas I like onto my Pinboard. Thanks for the chance to win! I love the Family Creed! I would display this in our family room as a daily reminder! I love the nursery art canvas set. So cute! I love the He/she boards and the heart shaped love story one. Such cute ways to tell your love story. I love the "Elite" series of the custom canvas word art! So cool! 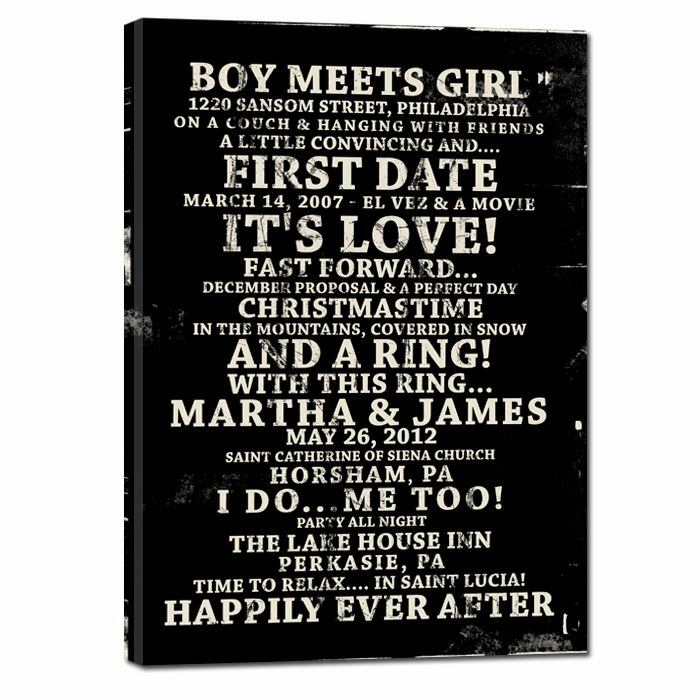 I love the Elite 20X24 Custom Canvas with dates- the day you met, got engaged, married- so sweet! Love them all!! So hard to pick one! But I would definetly love to have one made up for my kids. There is a PERFECT spot in the hallway by their bedrooms that one of these would fit perfectly into!!! All you need is love...and a Dog is my favorite, but geez, they're all my favorites! I had pictures taken a few months ago and have been wanting to have some canvases made so this would be a great opportunity! I would love to have the On Children canvas!! How beautiful!! I love the design with the wedding picture and first song lyrics! I would love to have that hanging in my home! This is my favorite http://geezees.com/shop-now/custom-canvas-20x40-3! I love that it's a simple way to document two lives coming together. I would LOVE a custom canvas with a picture of my husband and I during our first dance with the lyrics to the song surrounding the image. The pictures on Geezee are gorgeous!! 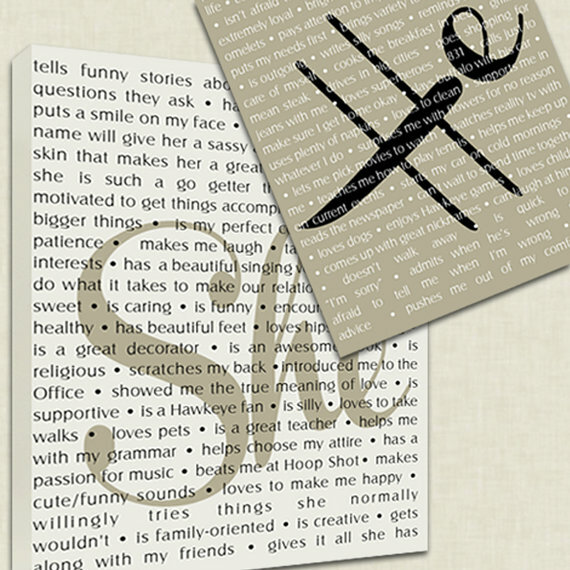 I pinned the He/She canvas - absolutely gorgeous!! SWOON!!! I complete adore the he/she canvas! I'm lovin the "All you need is Love and Coffee" canvas!! Lots of great canvas's!! I pinned the "All you need is Love and Coffee" canvas!! 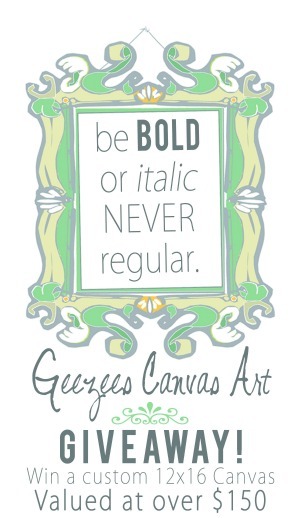 i love the typography canvas or the subway art canvas! They are all beautiful! Thanks for the giveaway! What a great giveaway and something I've wanted for a while. I'm not sure which one, but I would choose one of her pieces of word art. Pinned the he/she canvas as well! Oh how do you pick just one! I love all the wedding ones! Love the custom 16 x 32 and would love to put important family dates on it or even addresses. What a great site! I love these signs! I especially like the family rules! Fun! Fun! I like the family rules but they are all adorable!! I love the Custom Canvas Elite Series print! I pinned the Custom Canvas Elite Series! What a great shop! All of the personal photos with text were really great. And the subway art is always a fav for me. 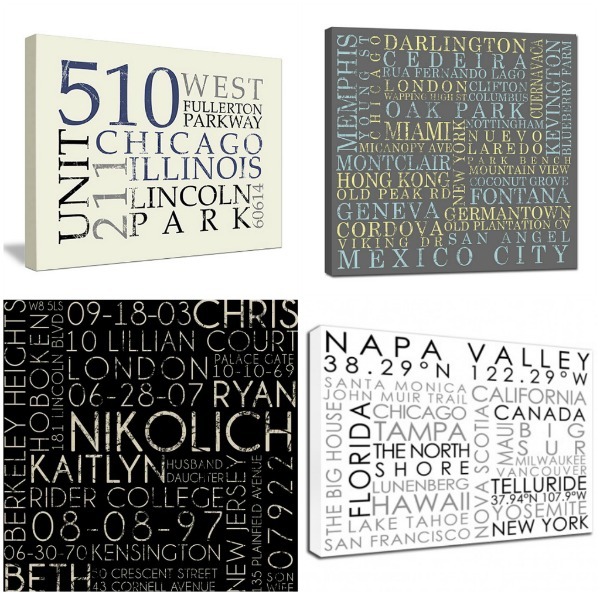 Would love to have one personalized for all of the places that I've lived and love. Great giveaway! Love the He/She canvas. I am thinking I may just go ahead with my order on that on. ;)Thanks for a great giveaway! I love the wedding picture canvas! I am getting married soon and it would be a perfect reminder of our special day!! I would pick the one with my address would be great! These are lovely! I actually like one that starts out, "in our home, we are ... and then it goes on to talk about great attributes. Thank you for this giveaway! These are the cutest prints ever. I need them all. I can't even decide which one i like best. I LOVE the nursery art. With baby #2 on the way it would be a great addition to the room. Love the canvas elite series with the family est. dates! Been looking for something like this for awhile- fantastic art work! I would definitely do a wedding photo with "our song" with it. I pinned a canvas from Geezee designs. I really love the house rules. I really love the house rules. Many of the others "spoke" to me, but as a single gal, I will just have to wait until Mr. Right is in the picture for some of the more romantic ones. Hey! So there are several that I really like. I love the wedding pictures w/ quotes on them or the pictures of the married couples. Pretty romantic and special I think. I also pinned the picture of the baby w/ the quote. I think that is so sweet and helps capture that time of their lifes. I would love to have that for each of my children to put in their rooms. I love the ones with the family photos so sweet! Oh so many to choose from! I love the special dates one and the custom aqua canvas. The "He" and "She" ones are romantic for a master bedroom. Sorry, I couldn't choose just one! HA! I love the wedding canvas art. My husband proposed to me by writing a song and singing it to me. I've been looking for a cute creative way to display the words of the song and this would work! I like the street names/special places canvas 12x24 black with tan letters. Or a photo only canvas. 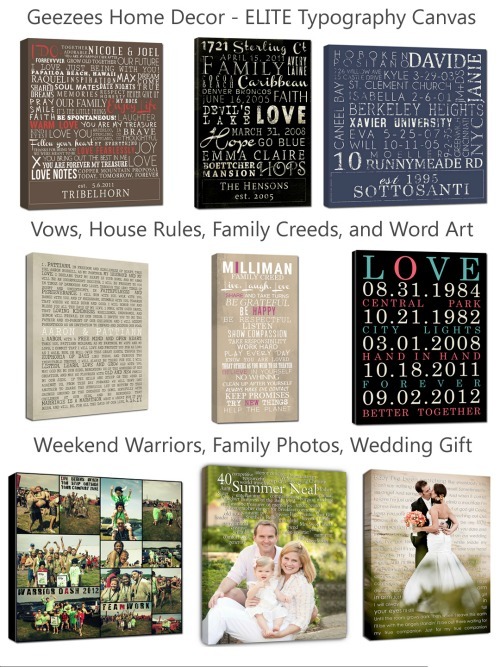 Just love ALL the creative canvas designs!It would be a hard choice but definitely family oriented! I like the House Rules on Canvas in Yellow! I pinned a "sweet baby Boy" word art canvas...gorgeous!! Love, love, love the "she/he"....though I have to admit the address subway is my very favorite. Thanks for the great giveaway. I am a newlywed so I love the custom prints with a wedding photo and the vows! Would absolutely die for one of these prints! I like the ones with the words like you pictured. like your address art. Love that idea. The instagram art would be awesome!! I would love a wedding photo with some journaling! All of the designs are so beautiful and personal, but the one that speaks to me most is the ultrasound print. We just found out that we are pregnant with our first, and I have been looking for a piece that would inspire me to create a specific look for a baby's room. This canvas would be the first piece of art in a room that I am so excited to start decorating. :). Thank you for your website! You inspire me all the time! I like the word art I think - its hard to choose. I love the baby picture canvas! I like the Canvas Elite series with the Bus Roll Subway art with address, etc. I love the heart shaped words!And the address art...I love it ALL! I would love one with our vows. What a great reminder of your promise, commitment, and love! I pinned the house rules, I love that too! There are so many great ones to choose from, but I'm drawn to the chevron! I of course love the address one! But I also love the heart picture collage and the chevron one!!! What awesome ideas!!! I love the house rules/family creed. I have also pinned several!!! It is so hard to choose. 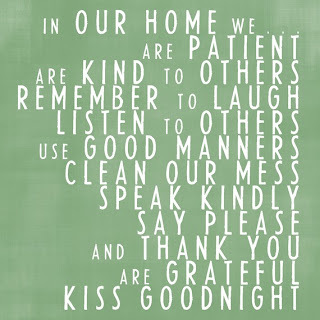 I love the word art - house rules or family creed. I absolutely love all of these! My favorite is the one with the special dates on it. It'd be absolutely perfect for my blended family. I love the canvas with the man & woman walking down a sidewalk surrounded by trees! I love the He/She prints and the address subway art. House Rules are a top favorite but since I am getting married soon, the wedding picture with the first song quote would be high on my list also!! Very cool web-site!! Going to go pin them both now! Oh my..I love them all. Maybe the All You Need is Love and Coffee canvas. I love all of them....how do I pick just one? I would love to get a family portrait on one with a cool quote printed on it. I loved the split word canvas art, now it will be picking the perfect spot! I love the split word canvas art! I absolutely MUST have a photo and word canvas art for my bedroom - I an in LOVE. Love the Transit Sign! I want one for my dining room! I love the TRANSIT Sign or Europe Subway Destination Bus Roll Tram Vintage Style Art Canvas! 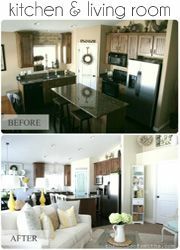 I pinned 2 of my favorite signs on Pinterest! So many great options. 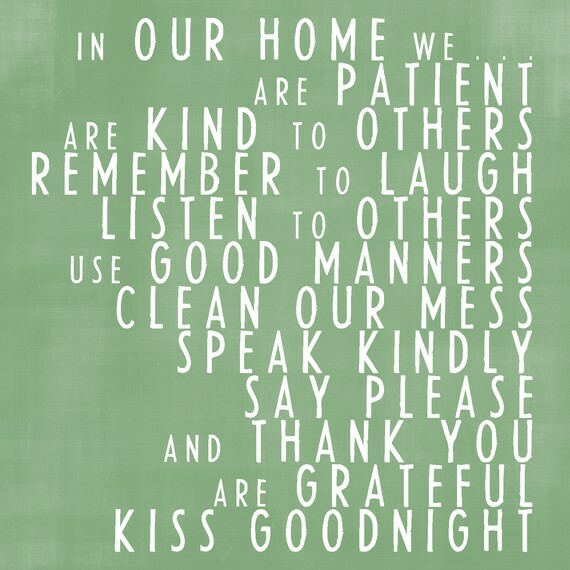 I have to say with 2 little ones in the house...I love the House Rules canvas. What a beautiful way to display little reminders of our House Rules for my little ones. I love the In Our Home...house rules. We can always use a little reminder. I love the canvas with your favorite song. Ours is More. That would be a great canvas! I also pinned a transit sign! I love the ones with the special names and places. The custom 10x20 is great. I pinned it as well! So wonderful! I love the wedding photo with words displayed behind-very powerful! I pinned my favorite canvas to my wish list! What a fabulous giveaway! Oh I love the idea of the subway address signs! I am kind of wanting a photo of husband and I from our wedding day with our wedding song on it! Hard to decide...but I think the family creed canvas! hard to decide, but I think it is the family creed canvas! This is exactly what I've been looking for! So many great options. I love the typography ones with places that are meaningful. I pinned my favorite to Pinterest! I have been wanting a canvas with the lyrics to my fav church song. There is a canvas offering that (24x36 maybe). I love how some of the lyrics are in a different color. I've wanted to do the address subway art ever since I saw yours. That is what I'd have done. Wow! They have so many wonderful ideas on their website! I love canvas elite with the address and city info. I have the perfect spot for it too. Thanks for the giveaway. Ok. I pinned two of my favorites! Thanks! I love the sign with the dates on it. But I would put the birth days of the all the people in my family. I also love the cancer awareness one in pink! 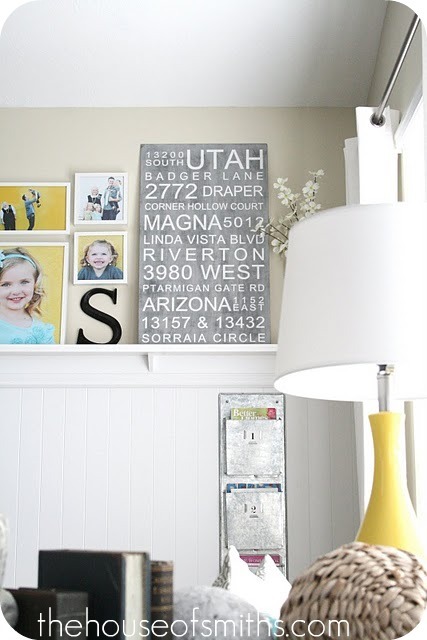 I love the address canvases and He and She split canvas! So cute! Love love love this idea. I would love to have any of the ones with a wedding photo and our vows..so beautiful. I pinned one of the ones I love. I love the Nursery Art! I pinned the Nursery Art Canvas! I pinned canvas "photo wedding engagement" on my "kiss to build a dream on" pinboard! What an awesome giveaway! Thanks for being so generous! I pinned "canvas photo wedding engagement" on my "kiss to build a dream on" pinboard. What a great giveaway! Thanks for being so generous! Love the Split Word Canvas Art!! I love all of the custom elite! But my FAVORITE has to be the small instagram/hipstamatic wall art. I have not seen the small 10x10 gallery wrapped photos! I would love them forever! Pinned the transit sign. Absolutely my fave! Thanks! Pinned the Transit sign, absolutely my fave! Thanks! I LOVE THE HOUSE RULES!!!! That's the one I pinned too! Pinned! I love the nursery art with Goodnight Moon and I'll Love you Forever. My kids are a little too old. But great baby shower gifts! I love the custom photo canvas, maybe with baby stats on it. We are expecting our first child (a girl) and this would be a great addition to her room. Pinned! Love the nursery art with Goodnight Moon and I'll Love you Forever. My kids are a little too old, but great for a baby shower gift! Love all the ones with the addresses/cities! The he/she is presh! I love the ones that have the words spanning three different canvases. I love the heart collage! I love the really large one on the wall! You cant miss it!!! It looks perfect for my home decor, I also love the Chevron one! I would love to own ether one or even both!!! I pinned both on my pinterest page! oh! and I also pinned it! I love the wedding photo, personalized vows would be beautiful. I really love the Custom Canvas Two 16X32′s!! I LOVE the ELITE art. It is perfect. I would love to do this in my living room. I love where you can customize the places you have been...so want to do that! I love the address one. I also love the Henry David Thoreau quote with the pink and orange and pinned it. I love the She/He art. So unique! I love the 4 canvas set. I've been wanting something like that for my living room.